, an English mathematician of great genius and eminence, was born at Bath in Somersetshire in 1707. His parents, who were quakers, were of low condition, and consequently neither able, from their circumstances, nor willing from their religious profession, to have him much instructed in that kind of learning which they are taught to despise as human. 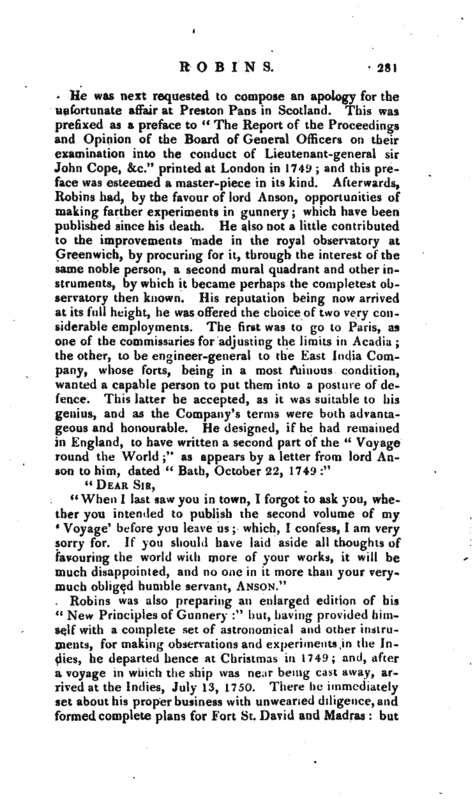 Yet he made an early and surprising progress in various branches of science and literature, in the mathematics particularly; and his friends, being desirous that he might continue his pursuits, and that his merit might not be buried in obscurity, wished that he could be properly recommended to teach this science in London. Accordingly, a specimen of his abilities was shewn to Dr. Pemberton, the author of the “View of Sir Isaac Newton’s Philosophy;” who conceiving a good opinion of the writer, for a farther trial of his proficiency, sent him some problems, which Robins solved very much to his satisfaction. He then came to London, where he confirmed the opinion which had been formed of his abilities and knowledge. 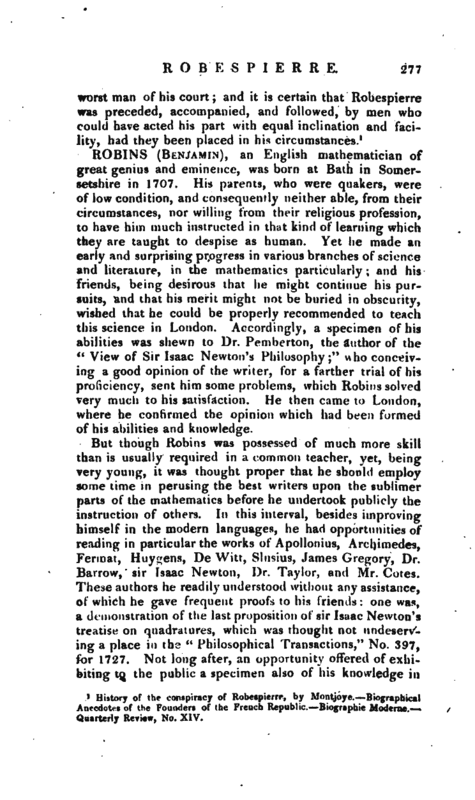 But though Robins was possessed of much more skill than is usually required in a common teacher, yet, being very young, it was thought proper that he should employ some time in perusing the best writers upon the sublimer parts of the mathematics before he undertook publicly the instruction of others. In this interval, besides improving himself in the modern languages, he had opportunities of reading in particular the works of Apollonius, Archimedes, Fermat, Huygens, De Witt, Slusius, James Gregory, Dr. Barrow, sir Isaac Newton, Dr. Taylor, and Mr. Cotes. These authors he readily understood without any assistance, of which he gave frequent proofs to his friends: one was, a demonstration of the last proposition of sir Isaac Newton’s treatise on quadratures, which was thought not undeserving a place in the “Philosophical Transactions,” No. 397, for 1727. Not long after, an opportunity offered of exhibiting to the public a specimen also of his knowledge in | natural philosophy. The royal academy of sciences at Paris had proposed, among their prize-questions in 1724 and 1726, to demonstrate the laws. of motion in bodies impinging on one another. John Bernoulli here condescended to be a candidate; and, though his dissertation lost the reward, he appealed to the learned world by printing it in 1727; and, in it, endeavoured to establish Leibnitz’s opinion of the force of bodies in motion, from the effects of their striking against springing materials; as signor Poleni had before attempted to evince the same thing from experiments of bodies falling on soft and yielding substances. But as the insufficiency of Poleni’s arguments had been demonstrated in the “Philosophical Transactions,” No. 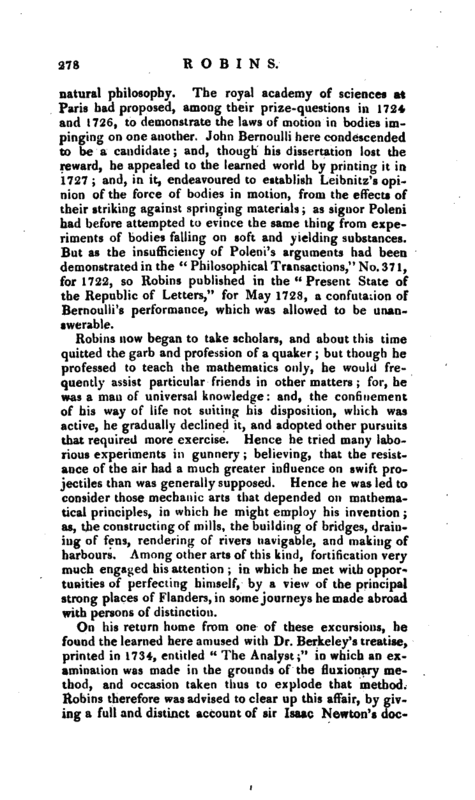 371, for 1722, so Robins published in the “Present State of the Republic of Letters,” for May 1728, a confutation of Bernoulli’s performance, which was allowed to be unanswerable. Robins now began to take scholars, and about this time quitted the garb and profession of a quaker; but though he professed to teach the mathematics only, he would frequently assist particular friends in other matters; for, he was a man of universal knowledge: and, the confinement of his way of life not suiting his disposition, which was active, he gradually declined it, and adopted other pursuits that required more exercise. Hence he tried many laborious experiments in gunnery; believing, that the resistance of the air had a much greater influence on swift projectiles than was generally supposed. Hence he was led to consider those mechanic arts that depended on mathematical principles, in which he might employ his invention; as, the constructing of mills, the building of bridges, draining of fens, rendering of rivers navigable, and making of harbours. Among other arts of this kind, fortification very much engaged his attention; in which he met with opportunities of perfecting himself, by a view of the principal strong places of Flanders, in some journeys he made abroad with persons of distinction. On his return home from one of these excursions, he found the learned here amused with Dr. Berkeley’s treatise, printed in 1734, entitled “The Analyst;” in which an examination was made in the grounds of the fluxionary method, and occasion taken thus to explode that method. Robins therefore was advised to clear up this affair, by giving a full and distinct account of sir Isaac Newton’s | doctrines in such a manner as to obviate all the objections, without naming them, which had been advanced -by the author of “The Analyst;” and accordingly he published, in 1735, “A Discourse concerning the nature and certainty of sir Isaac Newton’s method of Fluxions, and of prime and ultimate ratios.” Some even of those who had written against “The Analyst,” taking exception at Robins’s manner of defending sir Isaac Newton’s doctrine, he afterwards wrote two or three additional discourses. In 1738, he defended sir Isaac Newton against an objection, contained in a note at the end of a Latin piece, called “Matho, sive Cosmotheoria puerilis,” written by Baxter, author of the “Inquiry into the Nature of the human Soul;” and, the year after, printed “Remarks” on Euler’s “Treatise of Motion,” on Smith’s “System of Optics,” and on Jurin’s “Discourse of distinct and indistinct Vision,” annexed to Dr. Smith’s work. 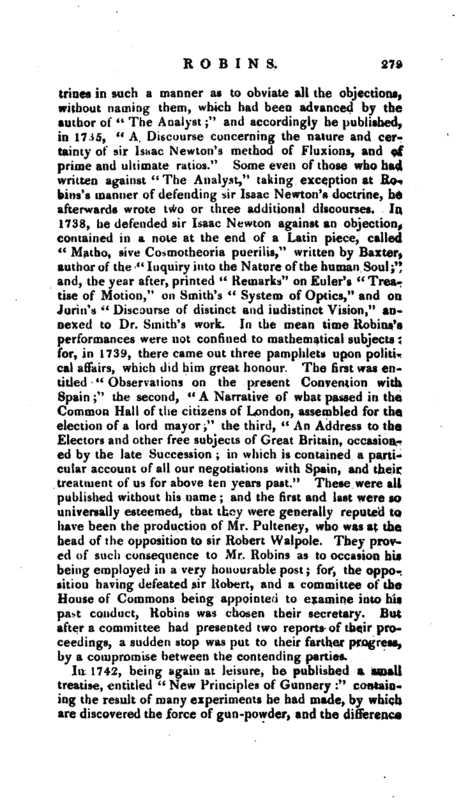 In the mean time Robins’s performances were not confined to mathematical subjects: for, in 1739, there came out three pamphlets upon political affairs, which did him great honour. The first was entitled “Observations on the present Convention with Spain;” the second, “A Narrative of what passed in the Common Hall of the citizens of London, assembled for the election of a lord mayor;” the third, “An Address to the Electors and other free subjects of Great Britain, occasioned by the late Succession; in which is contained a particular account of all our negotiations with Spain, and their treatment of us for above ten years past.” These were all published without his name; and the first and last were so universally esteemed, that they were generally reputed to have been the production of Mr. Pulteney, who was at the head of the opposition to sir Robert Walpole. They proved of such consequence to Mr. Robins as to occasion his being employed in a very honourable post; for, the opposition having defeated sir Robert, and a committee of the House of Commons being appointed to" examine into his past conduct, Robins was chosen their secretary. But after a committee had presented two reports of their proceedings, a sudden stop was put to their farther progress, by a compromise between the contending parties. In 1742, being again at leisure, he published a small treatise, entitled “New Principles of Gunnery:” containing the result of many experiments he had made, by which are discovered the force of gun-powder, and the difference | in the resisting power of the air to swift and slow motion. This treatise was preceded by an account of the progress which modern fortification had made from its first rise; as also of the invention of gun-powder, and of what had already been performed in the theory of gunnery. 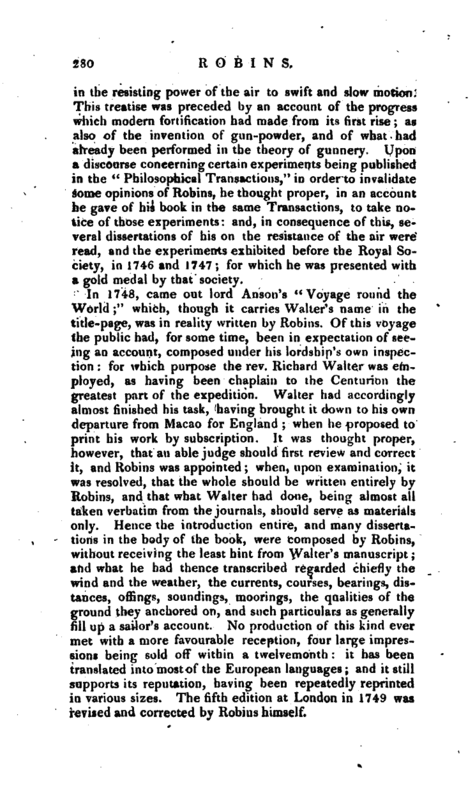 Upon a discourse concerning certain experiments being published in the “Philosophical Transactions,” in order to invalidate some opinions of Robins, he thought proper, in an account he gave of his book in the same Transactions, to take notice of those experiments: and, in consequence of this, several dissertations of his on the resistance of the air were read, and the experiments exhibited before the Royal Society, in 1746 and 1747; for which he was presented with a gold medal by that society. Robins was also preparing an enlarged edition of his ``New Principles of Gunnery:’' but, having provided himself with a complete set of astronomical and other instruments, for making observations and experiments in the Indies, he departed hence at Christmas in 1749; and, after a voyage in which the ship was near being cast away, arrived at the Indies, July 13, 1750. There he immediately set about his proper business with unwearied diligence, and formed complete plans for Fort St. David and Madras: but | he lived not to put them into execution. For, the great difference of the climate being beyond his constitution to support, he was attacked by a fever in September; and, though he recovered out of this, yet about eight months after he fell into a languishing condition, in which he continued till his death, July 29, 1751. By his last will, he left the publishing of his mathematical works to his honoured and intimate friend Martin Folkes, esq. president of the Royal Society, and to James Wilson, M. D. doctor of physic; but, the former of these gentlemen being incapacitated by a paralytic disorder for some time before his death, they were afterwards published by the latter, 1761, 2 vols. 8vo. 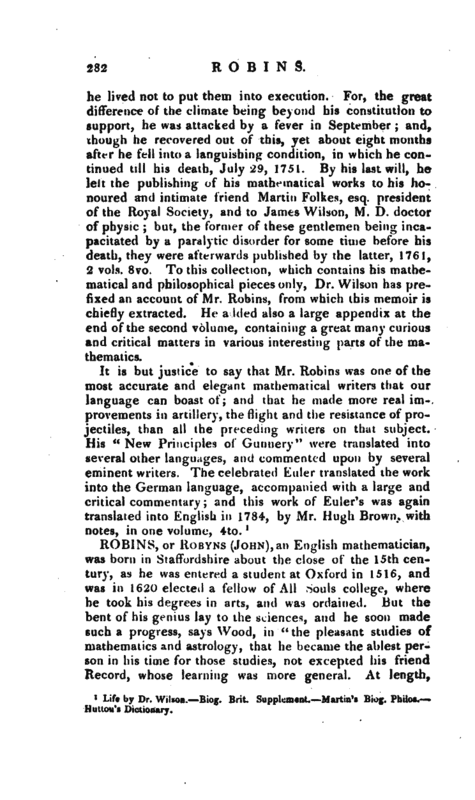 To this collection, which contains his mathematical and philosophical pieces only, Dr. Wilson has prefixed an account of Mr. Robins, from which this memoir is chiefly extracted. He added also a large appendix at the end of the second volume, containing a great many curious and critical matters in various interesting parts of the mathematics. Life by Dr. Wilson. Biog. Brit. Supplement. Martin’s Biog. Philos. —Hutton’s Dictionary.